The Amazon MWS Feeds API section of the Amazon Marketplace Web Service (Amazon MWS) API lets you upload inventory and order data to Amazon. You can also use the Amazon MWS Feeds API section to get information about the processing of feeds. Submit an XML or flat file using the SubmitFeed operation along with an encrypted header and all required metadata, including a value from the FeedType. As with all submissions to Amazon MWS, you must also include authentication information. The SubmitFeed operation returns a FeedSubmissionId, which you can use to periodically check the status of the feed using the GetFeedSubmissionList operation. Note: Rather than repeatedly polling the GetFeedSubmissionList operation to find out when feed processing is complete, Amazon recommends subscribing to the FeedProcessingFinishedNotification notification. After you subscribe, for each feed you submit Amazon will send you a push notification when feed processing is complete. This makes your workflow more efficient and helps you avoid exceeding the throttling limits of the GetFeedSubmissionList operation. For more information, see FeedProcessingFinishedNotification. If Amazon MWS is still processing a request, the FeedProcessingStatus element of the GetFeedSubmissionList operation returns a status of _IN_PROGRESS_. If the processing is complete, a status of _DONE_ is returned. When the feed processing is complete, you can use the GetFeedSubmissionResult operation to receive a processing report that describes which records in the feed were successful and which records generated errors. 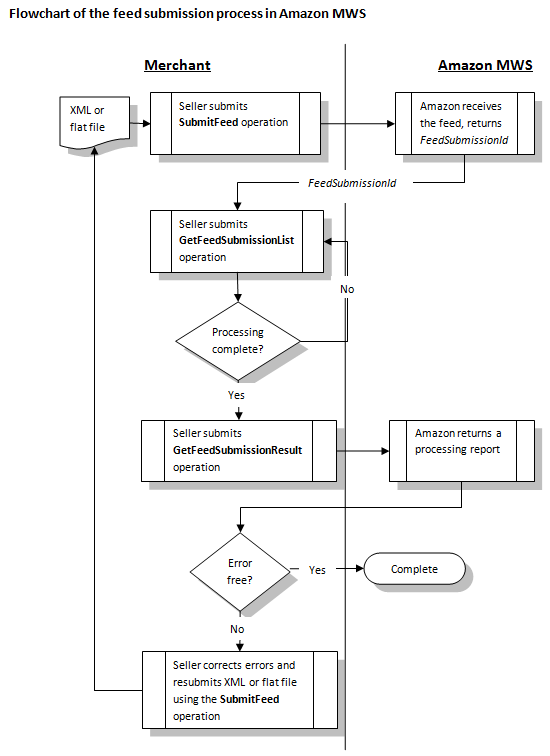 Note that you have to set up a stream that Amazon MWS uses to write out the report when you submit the GetFeedSubmissionResult operation. Use the Amazon MWS Feeds API section client library code for the GetFeedSubmissionResult operation to create the stream. Analyze the processing report, correct any errors in the file or transmission, and resubmit the feed using the SubmitFeed operation. Repeat the process until there are no errors in the processing report. When the processing report is error free, the transmission is complete. SubmitFeed Uploads a feed for processing by Amazon MWS. All marketplaces. GetFeedSubmissionList Returns a list of all feed submissions submitted in the previous 90 days. All marketplaces. GetFeedSubmissionListByNextToken Returns a list of feed submissions using the NextToken parameter. All marketplaces. GetFeedSubmissionCount Returns a count of the feeds submitted in the previous 90 days. All marketplaces. CancelFeedSubmissions Cancels one or more feed submissions and returns a count of the feed submissions that were canceled. All marketplaces. GetFeedSubmissionResult Returns the feed processing report and the Content-MD5 header. All marketplaces.